Got all my forces for Covenant of Antarctica unboxed and assembled last night. Due to having next to no flash or mould lines there was VERY little cleaning required on that front which helped speed things along. Going to get my cleaning brush out tonight and give the resin a good wash to clear any mould release off. Can then under coat my test models and chuck some paint on them. The paint job I am wanting to test out and make sure it looks alright is as follows. The majority of the plating and armour will be white, with light grey panels in certain locations to break up the white and add to a snow camo effect. The exposed metal superstructure and pistons will be boltgun metal. The cogs, some energy gun parts and other gear type parts will be brass coloured. Add to this some shadowing and washes and then the fine details like windows, rivets and lights and I hope it will look as good as it does in my head. 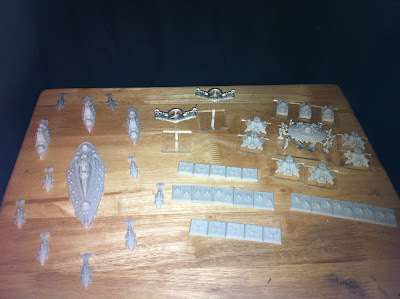 I'm hoping to get the test miniatures under way, and maybe even complete, tonight. Shouldn't take too long to do them as they are only small. Will aim to get a post up by about 1900/2000.